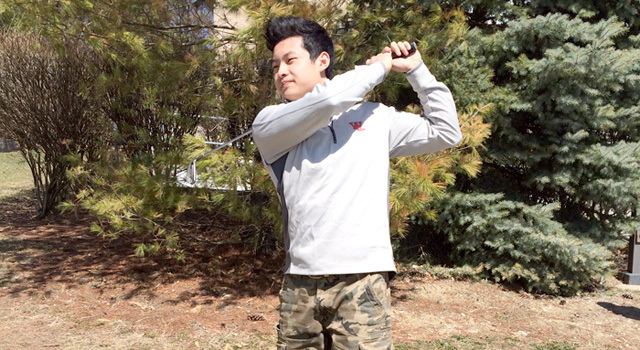 Joseph Kim ’15 is a two-sport athlete (golf and wrestling) known throughout the school among his friends and acquaintances as “Ghetto Joe”. According to Kim, this nickname came about when his friends started teasing him about his “roots” since he was born in California. He decided to play along with this joke and became “Ghetto Joe”. “The nickname started my freshman year during wrestling. Mr. Roseman, the wrestling coach, thought that I was really ghetto since I hustle all the time. I view this as a sign of respect,” Kim said. Kim was cut from the golf team his freshman year when Shane Fry was the head boys’ golf coach. “Before golf season started my freshman year, Mr. Roseman said that he would put in a good word for me to Coach Fry. Even after that I still got cut so that meant I really sucked,” Kim said. During the summer after his freshman year Kim worked hard at his golf game in order to earn a spot on the team the following year. His efforts were rewarded, as Kim played on the JV team his sophomore year. During his sophomore year, John Ambrose became the new golf coach. Ambrose had coached Kim for the two years when Kim was on the junior high team. “I consider him a survivor. He’s improved tremendously over the last five years. He wasn’t in the varsity lineup last year but this year I think he has a chance to be on the varsity team.” Ambrose said. Kim was the eighth spot in the 12-man lineup on last year’s team. However, he occasionally shot low scores which were crucial in many of the JV’s wins. “He’s always there at the right place at the right time. He’s dedicated and you can always count on him,” Ambrose said. Kim’s role this year on an undermanned team will be to consistently shoot decent scores. “He’s a little inconsistent at times but when he’s playing well he can shoot some really low scores. We just need him to find a way to get more consistent,” Ambrose said. Along with his athletic skill set, Kim also has a lot of emotion and a funny personality. His teammates always enjoy playing alongside him. “It has definitely been a thrill ride playing with him the last couple of years. He has an assassin’s mentality and I can’t wait to see what kind of person he will become after he graduates high school,” fellow teammate Michael King’14 said.